German car manufacturer Daimler has decided to produce expensive Mercedes sedans in Russia and may begin assembling cars in Moscow. This is not the first company interested in emerging markets to open plants in Russia in spite of the sanctions. Last month alone, Japanese company Hitachi and German pharmaceutical company Merck launched their own plants in Russia. 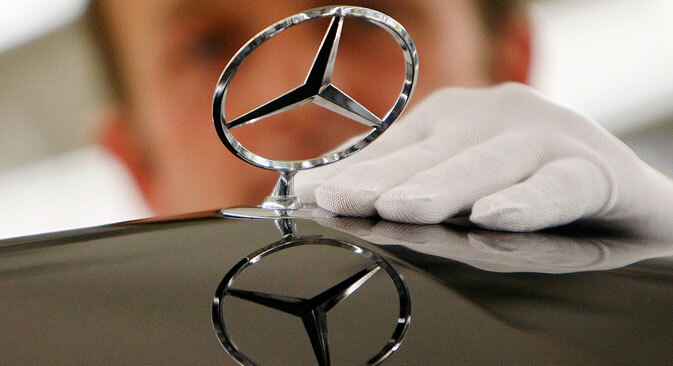 German car manufacturer Daimler is considering several sites to produce Mercedes vehicles in Russia, the Russian business newspaper RBC-Daily reports, providing links to its sources. According to the publication, the company is even considering the possibility of moving the assembly line to Moscow, where Renault-Nissan also assembles its automobiles. The German manufacturer plans to release high-end sedans in Russia. The parties are currently waiting for a decision to be made by Daimler’s board of directors, which will meet in mid-July. Daimler already has a joint venture in Russia with Russian truck manufacturer Kamaz, which makes Mercedes-Benz trucks in Naberezhnye Chelny (660 miles from Moscow). In turn, the Gaz Group assembles Mercedes-Benz Sprinter Classic minibuses in Nizhny Novgorod (260 miles from Moscow). The majority of Daimler’s competitors in the high-end sedan segment are already assembling their models in Russia. The Avtotor plant in Kaliningrad (a Russian exclave on the Baltic coast) assembles BMW sedans, and the Volkswagen plant in Kaluga (125 miles south of Moscow) manufactures the Audi A6 and A8. “A lot of companies are quite successful in localizing their production lines in Russia. Our country is developing, which ensures that the market and profits will continue to grow,” Invescafe analyst Roman Grinchenko said. According to him, in the absence of competitive domestic products, lowering market prices for end users allows companies to occupy a large share of the market. However, the instability of the ruble and sanctions against Russia are factors that have made analysts seriously reconsider their forecasts regarding the development of assembly operations in Russia. According to research conducted by Roland Berger commissioned by Russian company Sollers, “It would not make sense to localize production in Russia after 2017” if the economic environment remains the same and the import taxes are lowered due to World Trade Organization regulations. The market share for localized foreign car sales may drop from the current 52 percent to 26 percent. According to company data, Chinese brands, Peugeot-Citroen, BMW, Korean manufacturer SsangYong, and Opel will be at risk. Several companies have already decided against localization in Russia, although none of these companies are car manufacturers. In May 2014, for example, rumor had it that Johnny Walker had plans to localize production in Russia. However, Diageo has denied these claims. "Nevertheless, the localization of production for such products by major international market participants seems a very likely development in the medium term, given the high growth rates of whiskey and premium hard liquor sales in Russia," said Maxim Klyagin, an analyst at Finam Management. New companies are continuing to enter the Russian market. In July 2014, German pharmaceutical company Merck opened a plant in Ufa (835 miles east of Moscow) in order to manufacture Rebif, a drug used to treat multiple sclerosis. Merck is cooperating with Russian pharma giant Pharmstandard on the project. "Russia is a strategically important region for us, and we are considering the localization project to be an important and logical step in the development of the company," the head of Russia and CIS markets at Merck Serono Rogier Janssens told RBTH. According to him, localized production in Russia will make the original drug more affordable and accessible. Moreover, Rogier Janssens explained that Merck is currently considering other projects with leading Russian producers in specialized therapeutic areas, including oncology and endocrinology. The company Hitachi, in turn, dispatched its first five Hitachi ZX200-5G and ZX200LC-5G excavators produced in Russia from its plant in the Tver Region (adjacent to the Moscow Region) in June 2014. The plant was commissioned in December 2013, and investment in localization has totaled $72.9 million (2.5 billion RUB). Can Russia sue the U.S. and the EU via the WTO over sanctions? All products at the plant are made ​​in accordance with original specifications and technologies developed by Hitachi Construction Machinery designers in Japan, which have been adapted to the needs of Russian customers. According to Klyagin, production is likely to continue to be localized in Russia, but it is necessary to consider and compare the costs of developing new production facilities and lost profits from importing goods. "In a globalized economy, localization should be considered within the objective framework of practicality and should not be an end goal in itself. In some cases, the costs of localization may be too high," the expert warned.